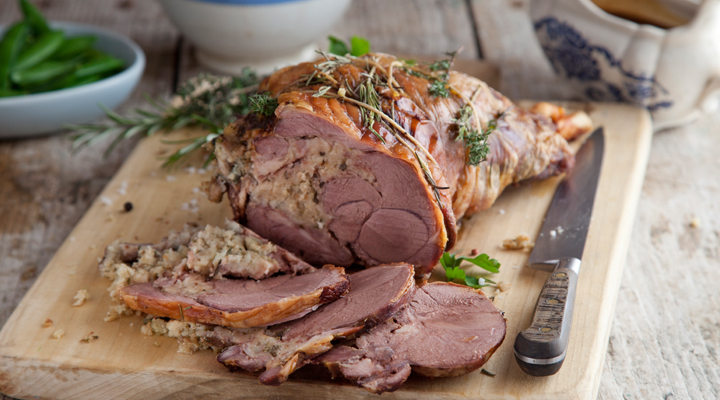 This lamb is packed with flavour - perfect for a Sunday roast! To make the stuffing, melt the butter in a large frying pan set over a medium heat. Cook the onion for 3 to 4 minutes, until softened but not coloured. Add the garlic and cook for another minute or so, stirring. Stir in the breadcrumbs, parsley and thyme and season to taste. Allow the stuffing to cool down. Once the stuffing has cooled, press it into the tunnel of the leg of lamb, then season the joint all over. Arrange the rosemary sprigs around the outside of the lamb and tie up with kitchen string. Place the lamb joint in a roasting tin, cover loosely with foil and roast for 1 hour 45 minutes. Remove the foil and baste with the cooking juices, then roast for another 30 minutes, until just tender. If you like your lamb more well done, give it up to 30 minutes more cooking time. To check that the lamb is cooked to your liking, insert a skewer into the thickest part of the meat and watch the juice that runs out – the pinker the juice, the rarer the meat. When it is cooked to your liking, transfer to a carving platter and leave to rest in a warm place for 30 minutes. Meanwhile, to make the gravy, place the roasting tin directly on the hob and stir in the flour. Cook for 1 minute, stirring continuously, then gradually add the stock, whisking until smooth after each addition and scraping the bottom of the tin to remove any sediment. Transfer the gravy to a small pan and whisk in the redcurrant jelly, then simmer gently until you have achieved the desired consistency. When the lamb is rested, carefully cut away the herb branches and string. Carve into slices, holding the shank end of the bone.